Four years ago, the Observer published my first article entitled All the President’s Muses. It was triggered by this picture, taken in the White House after the Benghazi murders. My concern was that President Barack Obama surrounded himself with former federal prosecutors who would do anything to win. . . . And, here they are again. 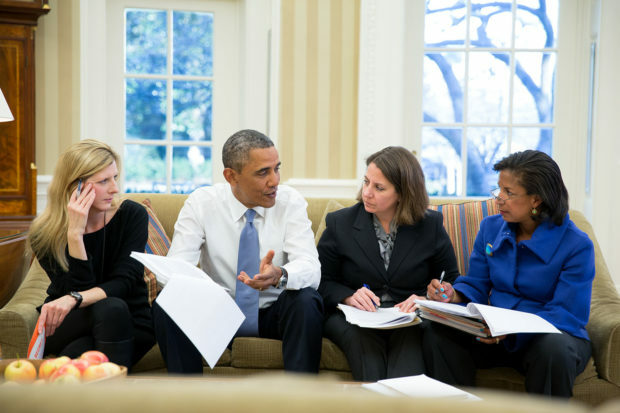 This triumvirate of cover-up experts is central to the Obama White House arm of the conspiracy to surveil the Trump campaign, the phony FISA warrant, “unmaskings” of Americans in the Trump campaign and denials of information to the incoming president of the United States. Who are they? Lisa Monaco was President Obama’s counter-terrorism and homeland security advisor. Guess what? She is yet another devotee of Robert Mueller and his chief lieutenant Andrew Weissmann. So was Kathryn Ruemmler — President Obama’s long-term White House Counsel. Indeed, their careers have long intertwined. Ruemmler and Monaco were prosecutors under Andrew Weissmann on the Enron Task Force, where they were all implicated in various forms of prosecutorial misconduct — well documented in my articles and my book “Licensed to Lie.” Indeed, Ms. Ruemmler signed a letter to defense counsel in the Merrill Lynch/Enron case that was false and deceptive, and she hid evidence that showed they were innocent. The Fifth Circuit reversed 12 out of 14 counts of conviction. Robert Mueller had a hand in selecting them for the Task Force. Monaco’s Enron Broadband prosecutions culminated in what Business Insider called The Utter Humiliation of the Enron Task Force. But thanks to the protection of Robert Mueller and President Obama, Monaco, Weissmann and Ruemmler were all promoted. Ms. Monaco served in Mueller’s FBI as his special counsel and as head of the National Security Division of the Department of Justice — where she was succeeded by John Carlin, yet another Mueller minion. This is the division implicated in the phony FISA application based on the Steele dossier and for which Bruce Ohr at the Department of Justice has now been twice demoted. Ms. Monaco’s most recent appearance is in the Page-Strzok text messages. As Chris Farrell of Judicial Watch predicts, expect to see more of her in the days to come. She often met with Andrew McCabe and may be the White House lynchpin for the FBI. Former National Security Advisor Susan Rice — the lone muse who was not on the Enron Task Force — was smack in the middle of the Benghazi lies and cover-up. She also “unmasked” countless names of American citizens working on the Trump transition whose transmissions were obtained by our intelligence agencies’ massive data collection. She included them in President Obama’s daily security briefings. Mr. Obama expanded those briefings to reach far more people than prior presidents. Most recently, Ms. Rice appears in a bizarre memo to “self” on Trump’s inauguration day. In the memo, she refers to a meeting in the White House 15 days earlier with FBI Director James Comey, Deputy Attorney General Sally Yates, the president, and Vice President Biden. Now Susan Rice is in the crosshairs of congressional investigators who want to know what they were talking about that day, and guess who’s coming to defend her? None other than her fellow muse Kathryn Ruemmler. Notably, President Obama valued Ms. Ruemmler’s ability to “see around corners.” Her connection to the corrupt cabal in play here traces back at least as far as Bill Clinton’s White House counsel’s office. After her headline-grabbing convictions on the Enron Task Force, Ms. Ruemmler alternated between vaunted positions in the Department of Justice and the legal powerhouse Latham & Watkins, which to this day boasts a large cadre of former Enron Task Force cronies. As President Obama’s White House Counsel, she expanded his use of executive orders, blocked Freedom of Information Act requests, stonewalled congressional inquiries, and rendered the administration a black box. It was only a matter of weeks after returning to Latham & Watkins from the White House that Ms. Ruemmler was defending the Clinton Foundation. Now, Ms. Ruemmler boldly leaps to the defense of her fellow muse Susan Rice. According to Ms. Ruemmler: “The discussion that Ambassador Rice documented did not involve the so-called Steele dossier.” It’s all “another attempt to distract and deflect from the importance of the ongoing investigations into Russian meddling in America’s democracy.” Her narrowly-worded letter to Senator Charles Grassley on behalf of Ambassador Rice is most notable for the questions it does not answer. It appears that if Ms. Rice were called to testify under oath, she may have to invoke the Fifth Amendment. Just ignore the Strzok-Page text message that President Obama wanted “to know everything” back as far as September 2016. Never mind the Steele dossier was bought and paid for by Clinton and the DNC. Forget the fictional dossier was the foundation of a gargantuan effort to prove Trump-Russia “collusion,” withhold information from the incoming administration, conduct illegal surveillance, obstruct justice, lie to courts, and to justify special counsel. Overlook the fact that Comey went to brief Trump on the dossier the next day. No, President Obama did not discuss any of this on January 5 with the most senior people in the real conspiracy — at least not in THAT conversation. He just said handle it “by the book.” Kathryn Ruemmler and Susan Rice have said so. No doubt Ms. Monaco will agree. Muse on this for a while. Sidney Powell, former federal prosecutor and veteran of 500 federal appeals, is the author of LICENSED TO LIE: Exposing Corruption in the Department of Justice. She is a Senior Fellow of the London Center for Policy Research and Senior Policy Advisor for America First. Last edited by Newmexican; 03-01-2018 at 10:33 PM. The women are not looking good in this one. Shame!